Story: Ferd'nand is the pleasant everyday man living with his wife, son and dog, struggling with everyday problems. Background notes: Ferd'nand is an interesting and unique series for several reasons. 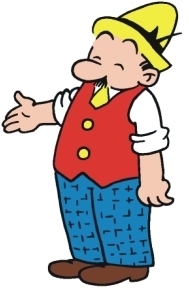 The series was created by Henning Dahl Mikkelsen in 1937, which makes it one of the longest running comic strips at all, and in the 70 years it's been running it has basically stayed the same. Back in 1937 when the series was created, pantomime series were quite common. It was a practical thing in regards to not having to pay for translations, and it was a way of telling a story, deeply rooted in the Danish traditions for storytelling in theaters, movies and comics. Today, pantomime series are almost extinct, and Ferd'nand is currently the only one left being published on a large international scale. When the series started, it was published thru the Danish agency P.I.B. (Presse Illustrations Bureau) in Copenhagen, but as the series gained fame in Europe, the series was brought to USA by P.I.B. in 1947, where United Feature Syndicate started distributing the dailies (and still do) from November, 10 and the Sunday strips from April 4, 1948. Mik himself moved to California where he continued the strip until his death in 1982. Along the way he got some help with the series, among other from Al Plastino (recognizable by the signature Al + Mik), Frank Thomas, Del Connell, and Garé Barks according to the information currently available. 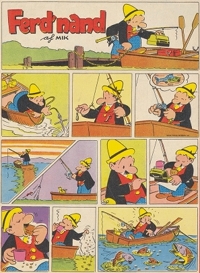 In 1989 the series was taken over by the Danish cartoonist Henrik Rehr, who has kept the feel and look of the series. Ferd'nand made a small trip outside his comic strip. 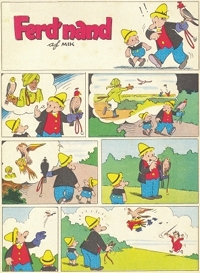 The cartoons Ferd'nand på fisketur and Ferd'nand på bjørnejagt from 1944 and 1945 respectively were made with Mik as the director, but other than that he has remained a comic strip character.